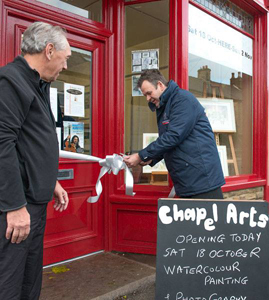 Chapel Arts (CA) was formed in 2014 as an organisation run by volunteers to promote arts in the local community. We aim to promote all art forms, wherever there is a local interest. In promoting arts in Chapel-en-le-Frith we intend to put on all sorts of events covering visual arts and crafts, performing arts, literary arts and film. In the longer term we aim to secure a building to serve as an Arts Centre as a focus for our activities and for people to use as a meeting place. In the short term we will use any suitable building within the area. Our first event was a pop-up shop which we were able to open from Saturday 18 October to Sunday 2 November thanks to the generous donation of the space by Horderns Motor House. The shop proved very popular and allowed us to showcase the work of many local artists and craftspeople, run a range of introductory workshops such as digital photography, drawing and working with clay. There were craft events including kite-making through jewellery-making to textiles. Chapel Players provided an exhibition of their theatrical costumes and children had great fun trying them on. Literary events included local author Berlie Doherty reading from her new book 'Company of Ghosts'. Performances by Chapel Ladies Choir and Chapel Male Voice Choir were popular and the final concert by Fiddlesticks was excellent ensuring we closed on a real high. The pop-up shop provided an opportunity for the people of Chapel to tell us what sort of arts and art events they would be interested in supporting. November also saw us chosen by Waitrose Buxton as one of their charities of the month in recognition of our ambition to stimulate involvement in the arts in our locality. It also marked the start of the work on the website and we hope you enjoy browsing our site. It has links to our Facebook page so why not go along and Follow us. A successful 2014 drew to an end with a splendid non-denominational Community Christmas Singalong held in St Thomas Becket Church and ably compered by the warm and witty Right Rev Jack Nicholls, former Bishop of Sheffield. Well over 100 'singalongers' enjoyed singing a selection of carols and Christmas songs and listening to the poems and readings as well as solos by the talented mezzo soprano, Zoe Buxton. From the excellent feedback we have had from participants we are sure the Singalong will become an annual favourite. Work in now well underway for our 2015 programme. So keep an eye on our website and Facebook page for more details. For updates on future activities or events sign up to our mailing list on the bottom of our Home page. If you would like to suggest arts activities for the future, or would like to be involved in planning new events please send us a message via our Get Involved page.